A funky, fun, colorful, and inviting place to enjoy an excellent cup of coffee, Common Grounds is frequented by students, artists, and the young business elite. Burgundy walls are trimmed with a bright pumpkin orange along doorways and lighting fixtures. 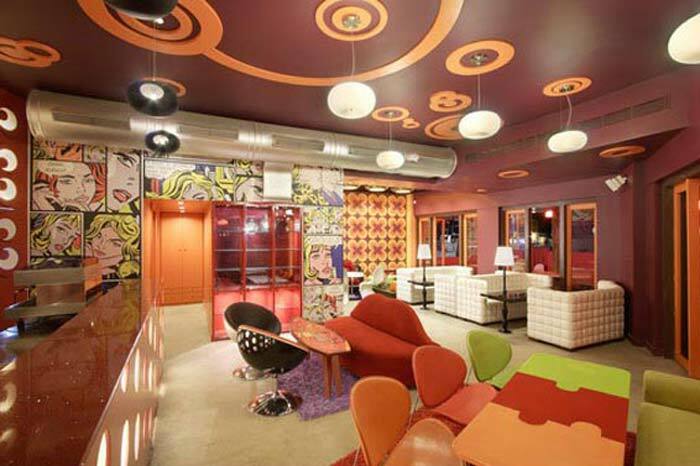 Several orange circles of varying sizes decorate the burgundy ceiling, creating an eye-pleasing geometric pattern. The back wall, which leads toward the bathrooms, is a large mural of a comic book page from the early fifties. White linoleum floors are decorated with bright fuzzy shag rugs in reds and purples. A large red lip-shaped couch with two black egg-chairs sits directly across from the counter. Off to the side are several tables that look like puzzle pieces in bright hues, lined with matching chairs and long couches. Beside the window are several white couch booths which provide a little more privacy for quiet conversations.